Apacer has announced the Apacer microSDXC/SDHC UHS-I U1 Class 10 (Read Speed up to 85 MB/s) lucky draw contest on Facebook to give away special prizes to the lucky winners. How do you enter the contest? Simple, just buy any one of the Apacer microSD R85 memory cards, available in 32GB/64GB/128GB. Tear off the sticker from the package to find a QR Code that links to the event page, or simply log on https://www.facebook.com/my2016.apacer/ with your own Facebook account. Enter the participating code inside the sticker to register for your lucky chance to win a GOPRO Hero 4, FUJIFILM X-A2 camera, or an Apacer Power Bank! The Apacer microSD R85 memory cards can be purchased from various stores, including ALL IT HYPERMARKET, VIEWNET and many more, or buy online from LAZADA. The microSD R85 memory cards are available at an extremely affordable price, ranging from RM59 for 32GB, RM99 for 64GB, to RM199 for 128GB. Winners will be announced on Apacer Malaysia Facebook page. Valid between 12th September and 31st October 2016, the contest is only for Malaysia and only Malaysian contestants are eligible to enter. Make sure you “Like” our page to receive winner updates. 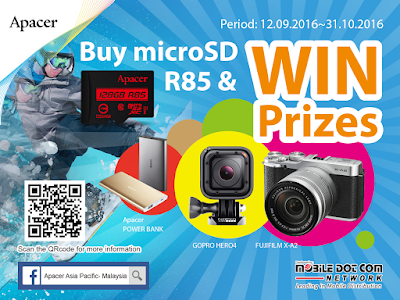 For more details, please visit the official Facebook page of Apacer Malaysia, https://www.facebook.com/my2016.apacer/. Apacer has unveiled its latest addition to their popular line of microSD memory cards- the microSDXC UHS-I U1 Class 10 (R85 MB/s) with 128GB capacity. Let worries over limited storage space on your smartphone on any other device be a thing of the past. With the Apacer microSDXC UHS-I U1 Class 10 128GB card, you can now store all your precious images, high definition videos and all your other important data effortlessly for a lifetime. With a speed rating of class 10 and Ultra High-Speed technology to deliver a minimum read speed of 85 MB/s, this is your super-fast solution to data transfer, along with quick app loading on your device. The card is equipped with advanced features and multiple protections to ensure absolute security of the data. Apacer offers lifetime warranty with confidence.